Karate is an art requiring physical conditioning, coordination, timing, alertness, self discipline, dedication, and an urge to learn. It is a long term goal, taking many hours of practice to gain proficiency. 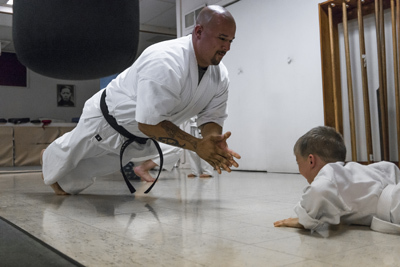 There are no shortcuts or secrets to learning Karate. Students receive from Karate, only what they put into it. If the student participates in the majority of classes, and practices on his/her own, the knowledge and ability of the art can be learned. Karate's aim is simply self-defense. To quote Master Gichin Funakoshi, the father of Japanese karate , "Karate ni sente nashi" or "There is no first attack in karate." Of course, defense and offense cannot exist without each other. Consequently, training in superior defensive techniques necessitates training in superior offensive techniques. We strive to uphold Funakoshi's philosophy at Sho Rei Shobu Kan. The style of Karate we teach at Council Bluffs Sho Rei Shobu Kan is called Goju-ryu. It is literally translated as "Hard-Soft style," and is created around the idea that a martial artist cannot be complete unless they have both. If you have any questions about classes or student fees, feel free to contact us. Copyright 2013 - Council Bluffs Sho Rei Shobu Kan. All rights reserved.